U.S. DEPARTMENT OF AGRICULTURE . FOREST SERVICE . WASHINGTON, D.C.
Mark J. Schroeder, " " "
Richard C. Rothermal, " " "
Michael A. Fosberg, " " "
This report presents the study made of the Loop Fire Disaster by the Analysis Group. It describes causes and circumstances relating to the tragedy and recommends ways to prevent similar accidents in the future. It may be supplemented later if hospitalized survivors are able to provide additional significant information. 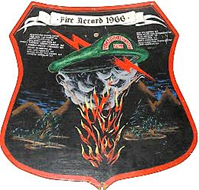 On November 1, 1966, in a canyon near the boundary of the Angeles National Forest, California, a flareup on the Loop Fire overran the Forest Service’s El Cariso Interregional Fire Crew, burned to death 10 firefighters and inflicted critical to minor injuries on 12 others. One of these critically injured men died at the Los Angeles County General Hospital on November 6. Forest Service Chief Ed Cliff immediately assigned a group of Fire Control experts to study the circumstances surrounding the tragic accident. This group, headed by Deputy Chief Hamilton K. Pyles, completed their study November 11 and prepared a report which describes the causes and circumstances relating to the tragedy and recommends ways to prevent similar accidents in the future. This brief summarizes that report. Overall action from discovery to final control of the Loop Fire was generally good. Included in this action were some outstanding events in the evacuation of hospital patients, the rescue of the survivors of the Chimney Canyon accident and the coordination of a number of agencies involved in control of the fire and rescue operations. From all that can be determined at this time, there was no evidence of negligence, disobedience or carelessness in the Loop Fire control operation based on present standards and practices. The highly localized decisions and actions which resulted in the tragedy points to the need of: (1) more specific direction on safe practices in similar topography; (2) specific control of helicopter attack; (3) scheduling of more complete inter- and intra-crew communication; and (4) adequate scouting to keep sector bosses currently informed when working in critical and possibly critical situations. Provide a physical checklist for downhill line operations whereby such an operation would be done only when all critical factors are aligned favorably and checked off on the list. This should be more than the standard firefighting orders of 10 rules now in use. Included in this checklist must be the factual knowledge that the toe of the fire edge will be held in a safe condition. Improve intelligence by helicopter or on-the-ground scouting or both at all critical points in the fire area and particularly where 2 crews are working toward each other. Increase the use of short-range lightweight radio units for intradivision operations on inter-crew operation as a secondary net. When 2 crews are working toward one another, communication must always be provided between them. This requires special arrangements between crews whose radios are on different frequencies. Increase efforts on the development of lightweight flame resistant suits, including face masks and gloves. When satisfactory items have been developed, make their use mandatory by trained men and fire suppression crew ordinarily assigned to work in fast burning fuels. Continue development of improved fire protective shelters and make them standard equipment for all fire suppression men and crews who are ordinarily assigned to fight fires in fast burning fuels. Reexamine the full array of presuppression activities in flash fuels areas and establish the benefits pus or minus of accelerating the fuel-break system in relation to safety and its place in the balance of all presuppression activities. Make crystal clear in firefighting training that a “chimney,” “narrow box canyon or similar topographic feature is a hazard area even if devoid of fuel. Establish a Task Force to study this incident in relation to the findings of the Task Force of 1957. Develop an action plan. The Loop Fire started at 5:19 a.m., November 1, 1966. It was caused by a faulty electric distribution line within the Department of the Army’s Los Pinetos Nike Site on the Tujunga Ranger District, Angeles National Forest. Pushed by Santa Ana winds of up to 60 miles per hour, the fire rapidly spread from the mountain top to the urban area between Pacoima Dam and the Olive View Sanitarium, Los Angeles County. Before being brought under control, it burned 2,028 acres, 1,436 acres of National Forest land and 592 acres of privately owned land. Peggy Hotchkiss, lookout on Mendenhall Peak, discovered the fire immediately. 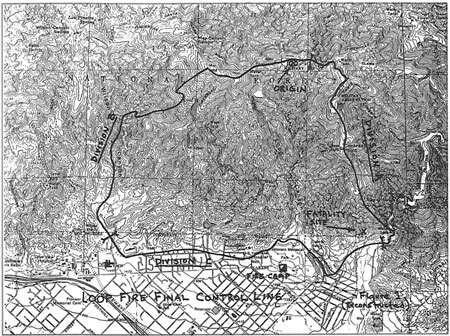 The first firemen attacked the fire 17 minutes later and within 30 minutes the Forest Service, Los Angeles County and Los Angeles City Fire Departments had joined forces to control the fire. Tujunga District Ranger Jesse J. Barton was in charge of the fire until 8:00 am. when William R. C. Beatty, Staff Fire Control Officer for the Angeles National Forest, took charge. Hugh Masterson was Line Boss and William C. Westmoreland was boss of Division A on the East side of the fire where the accident occurred. All are seasoned experienced Fire Control men. When the fatal accident occurred on the southeast corner of the fire, El Cariso Crew was attempting to connect a fireline some 200 feet long between Division A and Los Angeles County firefighters on Division C. This was the final action necessary to control the fire. Figure 1. (reconstructed) Map showing point of origin, protection area boundaries and control organization. Following instructions from Line Boss Hugh Masterson, at 3 p.m. El Cariso Crew Superintendent Gordon King led his men in a line building operation along the fire’s edge into the head of a steep, rocky chimney-like canyon. In forest firefighting language, this is called “cold trailing,” and is considered the safest method in California brush fields. From the head of the canyon (Point A, Figure 2), it appeared that this crew would have no trouble extending the control line to meet the Los Angeles County Crew plainly visible below. They didn’t know that near the base of the chimney canyon, a 30 foot deep gully with near vertical sides would delay the forward progress of the county crew. Superintendent King observed the situation from a point 500 feet from where the Los Angeles County line building was stopped at the west side of the gully. 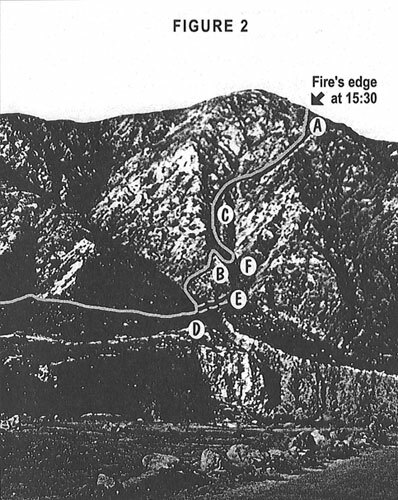 (Point B, Figure 2) The terrain was too steep to continue his cold trailing operation from the chimney canyon into the deep gully to the west and the bottom of this gully was obviously a difficult and dangerous place to hold the fire. The wind was from the southeast, favorable to holding the fire. There was no fire on the east side of the deep gully. He apparently decided that the quickest and safest way to control the fire was to tie in with 300 feet of natural firebreaks and build about 200 feet of control line through unburned fuel along the east edge of the gully to a point directly across from the County’s control line. (See dotted line, Figure 2) To do this would have taken King’s crew an estimated 15 minutes. But at 3:35 p.m. the fire direction changed due to topographic influence and surprised King and his crew. While he was positioning his men to build line, the fire crossed the gully, (Point E, Figure 2), ran up a 50 foot long slope and established itself in the chimney canyon below the El Cariso Crew and within 60 feet of Superintendent King. Before lead members of the crew could subdue this hot spot or take cover, fire swept from it up the chimney canyon and enveloped the men. It is estimated that the fire flashed through the 2,200’ long chimney canyon in less than one minute. Point F, Figure 2, in an area 200 feet long and 30 feet wide, is where 10 members of the crew burned to death. Superintendent King ran through the fire and stumbled, badly burned into a safe area below. Four members of the El Cariso Crew and Division Boss Westmoreland survived the fire in the upper end of the chimney. These men were uninjured except for Assistant Superintendent Warren P. Burchett, who was burned and hospitalized several days. The remaining 11 men survived in or near the diamond shaped area clearly visible on Figure 2. All of these latter survivors were seriously burned. Helicopter Pilot Troy Cook began rescue operations within 10 minutes after the men were burned. The diamond shaped area was still surrounded by fire when Pilot Cook hovered and picked up the first survivor. Pilot Roland Barton and his helicopter soon joined him and rescue operations continued with great courage and skill until all of the injured men were evacuated to the Los Angeles County Command Post on the Pacoima. From there the injured men were taken by auto to the hospital. When the accident occurred, temperatures at lower elevations were in the 90’s and at higher elevations in the high 70’s or low 80’s. Relative Humidity was 10 - 15 percent. Fuel moisture percents were 30-40 and ignition indexes varied from 76 to 93, which meant that almost every fire brand could start a fire in light fuels. The moisture content of live chamise in Pacoima Canyon on November 1 was 60 percent which is near the minimum possible for this species. A diminishing Santa Ana wind and the effects of steep rough topography were creating wind channeling and eddies. Fuels in the area were generally sparse, about 11 tons per acre. But at the very base of the Chimney Canyon where the fatalities occurred, sumac and heavy litter fuels were 35 tons per acre. Burning indexes were extreme. So when the fire crossed the deep gully and ignited the heavier fuels at the base of the Canyon, its heat was all directed up the natural chimney, creating a situation of very intense heat. This Day in History is dedicated to the 12 El Cariso Hotshots who lost their lives and the 11 others who received life threatening burns on the Loop Fire. November 1, 1966 – The Angeles National Forest in Southern California is known for its steep, rocky terrain and common strong, dry downhill wind, known as Santa Ana winds. 0519 A fire is started by a faulty electric line on the Nike Missile Site, on an exposed ridge at the head of Loop Canyon. Chamise, sage and sumac are the dominant fuels, with critically low live fuel moistures. Santa Ana conditions prevail and the fire is driven downhill rapidly by 60 MPH NE winds toward an urban area at the bottom of the canyon. The temperature is 73 degrees with 15% relative humidity (RH). At 0520 A lookout reports the fire. 0536 Initial attack takes place. 0600 More crews arrive. 0830 The Fire Weather Forecaster issues a warning of Santa Ana conditions in the fire area, a high temperature of 95 and 10% RH. Firefighters are experiencing E-NE winds at 40-60 MPH. 1300 The temperature is 80 degrees and a 12% RH. 1430 The El Cariso Hotshots arrive at Contractors Point above Loop Canyon. They receive instruction to leap-frog the other crews and cold-trail down the east flank. Much of the fire’s edge is in or near a chimney canyon. Winds are decreasing but there is still considerable channeling and eddies. 1500 The El Cariso crew decides it is possible to cold-trail down the chimney and tie in with the crews working the lower edge of the fire. It is noted that there is no clean black. 1535 Only 500 feet away from tying in with cat lines at the bottom, the terrain is too steep and they decide to go indirect 50-100 feet away from the fire’s edge. They are working in an area of unburned fuel and hazardous topography and are unaware that the fire has established a hot spot at the base of the chimney below them, burning in sumac bushes and heavy litter. Their escape routes are inadequate. 1545 A flare-up occurs and the order to “reverse tool order” is immediately given to the crew. In less than 1 minute the fire flashes through the 2,200 ft. chimney overcoming the 23 firefighters. In 1966, this incident made us recognize the need for downhill line construction guidelines. Using page 9 in your IRPG, discuss how you and your crew will realistically apply this checklist. The El Cariso crew was not notified that the assignment had previously been turned down. Using pages 19 in your IRPG, identify what must be communicated and to who, if an assignment is turned down. Crews working at the bottom of the fire saw that the fire had moved below El Cariso crew in the chimney. Unfortunately the crew leaders could not communicate a warning to El Cariso since it was not common for crew leaders to carry or be issued radios as we do today. Identify the protocol your crew/unit has to inform others of hazards. When the flare up occurred, 11 crew members moved into and near an emergency survival area. PPE and fire shelters would have lessened the severity of their injuries. Ensure that your crew has the appropriate PPE, that it is in good condition, and it is known how to wear/use it correctly. Many firefighters across the country will fight fire in Southern California at some point in their career. What unique topographic, weather, and fuel conditions will you be watchful of?